I love love love this dish! Some people cut the chicken breast up and mix with the pasta and alfredo sauce but I like to grill my chicken and lay it right on top. This way you do not lose the grilled taste to the chicken. I love cream based sauces and alfredo is on the top of my list. 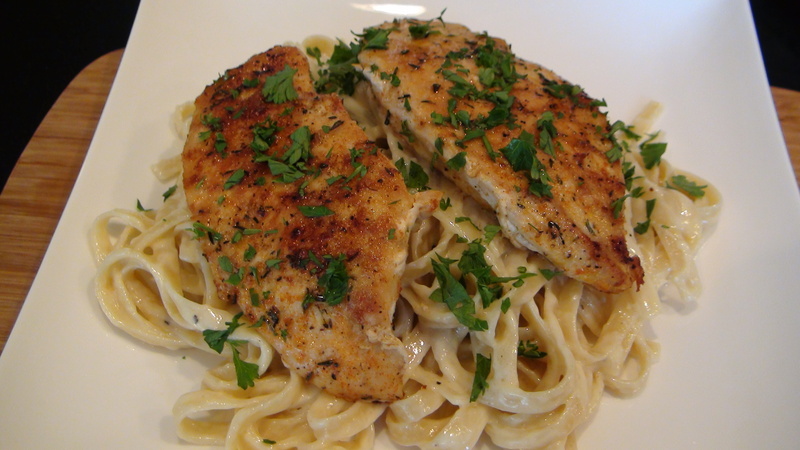 I love to use alfredo with all types of pasta. If there is someone in your family or someone you know who is allergic to wheat you can use eggs noodles, that’s really yummy also. This is a quick but filling meal and will surely satisfy the taste buds to infinity and beyond!! HAHA ok, I’ve been listening to my kids way too much this week!! BUT really it was that good, Hubby and both of the kids gave it the Super thumbs up! Enoy, Enjoy and Enjoy!!! And one more ENJOY!! SO MUCH FREAKIN FRAT FLAVOR!! ** TIP: Substitute Heavy Whipping Cream with Greek Yogurt for a healthier option!! TERRIFIC recipe! You got another winner. looks delicious….. the chicken does not look like it was just grilled. how did you accomplish it looking like it is breaded. what is that on top of the chicken? i see the parsley, but looks like something else. no grill marks. whatever you did, looks like it will be delicious. thanks for your reply. yes, it does look “yummy” going to try this weekend. Hi BJ – I love it too, I know you will love this recipe at home so you can make it as often as you like. Thank you for visiting come back and find more great recipes. Hello Viridiana, thank you for visiting and trying ShesGotFlavor recipes. This recipes serves 4-6 people. Please never wash your meat. Washing raw meat is a serious food safety contamination concern. It can spread pathogens not only from the meat to your kitchen but also spreads any pathogens around and throughout your meat.